Fig. 36 Distribution channel. Some distribution channels for kitchenware. Fig. 35 Distribution channel. Examples of typical channels of distribution. The route used in the physical distribution of a PRODUCT from the MANUFACTURER to the ultimate buyer of that product. retailing (the sale of the product to the final buyer) (see WHOLESALER, RETAILER). Organizationally these functions may be undertaken by firms which specialize at a particular stage in the chain or they may be combined wholly or partially, and undertaken by the one firm as an integrated operation (see VERTICAL INTEGRATION). The attractions of ‘INTERNALIZING’ the distribution function include the avoidance of TRANSACTION COSTS involved in dealing through the market, better control and coordination of the movement of products, various advantages over competitors (see FORECLOSURE, PRICE SQUEEZE) and the more effective MARKETING of products. Thus, depending upon the traditions of the trade, the nature of the product and the characteristics of the market being served, and the relative costs and marketing effectiveness of using different channel intermediaries, a number of distributive channel configurations may be identified, as Fig. 35 illustrates. Line 1 shows a conventional channel structure with the products being moved on an arms-length basis, that is, through independent intermediaries at each separate stage. Alternatively (line 2), a retailer such as a SUPERMARKET chain may buy in bulk direct from manufacturers and undertake the wholesaling function itself as an integrated wholesaling-retailing operation; a manufacturer may combine the production and wholesaling functions (line 3), on-selling to independent retailers or, alternatively, combine all three operations (line 4), selling direct to final buyers. Additionally, at some stage in a channel. SALES AGENTS, whose primary function is to generate new business contacts, may be employed. Typically, agents do not take title to the goods but are employed by, for example, a manufacturer to obtain new wholesale customers or a wholesaler seeking new retail accounts. For many products, distributive arrangements are multi-dimensional with a variety of modes employed depending upon which MARKET or MARKET SEGMENTS are being targeted (see Fig. 36). See VERTICAL MARKETING SYSTEM, SELECTIVE DISTRIBUTION, EXCLUSIVE DISTRIBUTION. the route used to distribute a good from the producer to the ultimate consumer of that good. 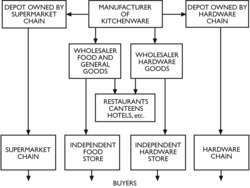 Functionally, a typical distribution channel consists of three basic inter-related operations: manufacturing (making the product); wholesaling (holding large STOCKS and ‘breaking bulk’ into retail packs); retailing (sale of the product to the final consumer) (see WHOLESALER, RETAILER). Organizationally, these functions may be undertaken by firms that specialize at a particular stage in the chain or they may be combined together, wholly or partially and undertaken by the one firm as an integrated operation (see VERTICAL INTEGRATION). The attractions of INTERNALIZING the distribution function include the avoidance of TRANSACTION COSTS involved in dealing through the market, better control and coordination of the movement of products, various advantages over competitors (see FORECLOSURE, PRICE SQUEEZE) and the more effective MARKETING of products. Thus, depending on the ‘traditions’ of the trade, the nature of the product and the characteristics of the market being served, and the relative costs and marketing effectiveness of using different channel intermediaries, a number of distributive channel configurations may be identified, as Fig. 49 illustrates. Line 1 shows a conventional channel structure, with the products being ‘moved’ on an arm's-length basis, that is, through independent intermediaries at each separate stage. Alternatively (line 2), a retailer such as a SUPERMARKET chain may buy in bulk direct from manufacturers and a SUPERMARKET chain may buy in bulk direct from manufacturers and undertake the wholesaling function itself as an integrated wholesaling-retailing operation; a manufacturer may combine the production and wholesaling functions (line 3), on-selling to independent retailers or, alternatively, combine all three operations (line 4), selling directly to final buyers. Additionally, at some stage in a channel, agents, whose primary function is to generate new business contacts, may be employed. For many products, distributive arrangements are multidimensional, with a variety of modes employed, depending upon which MARKET or MARKET SEGMENTS are being targeted. And it may very well be that the newer distribution channels will become the industry's greatest allies in helping to establish a more appropriate image, one that is built on helping consumers fashion a secure financial future. The focus on profitability also influences the insurer's growth plans in personal lines, via the different distribution channels. Eventually, all companies will be forced to embrace the Internet as a viable distribution channel, whether they sell directly to consumers or in partnership with their agency force. Sizes the distribution channels of mutual funds in five major European markets using FERI FMI data. Life Insurance Distribution Channels in Vietnam to 2018: Market Databook" provides detailed insight into the operating environment of the life insurance industry in Vietnam . Life Insurance Distribution Channels in Singapore to 2018: Market Databook" provides detailed insight into the operating environment of the life insurance industry in Singapore . Despite the clear business imperative to expand channels, many carriers have struggled to design and manage multiple distribution channels.